Several manufacturers in thetires market are increasingly leveraging nanotechnology as it helps in significantly reducing the wear and tear of heavy-duty vehicle tires. Tires with nanotechnology deliver superior performance in extreme conditions. They offer stronger grips to winter tires when traversing snow-covered pavements. Nanoprene, a high-performance rubber additive, which is used with the rubber mixture of the tire tread, significantly helps reduce wear and tear. 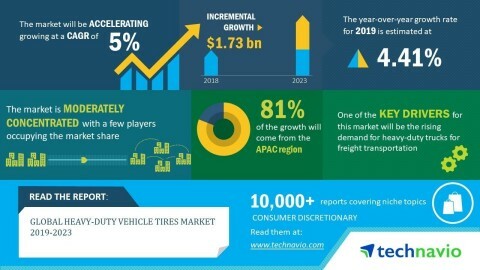 Thus, the adoption of nanotechnology in tire manufacturing will boost the growth of the heavy-duty vehicle tires market during the forecast period. "Rubber prices are continuously falling owing to low demand in countries such as the US and the UK, which witnessed softening automotive sales. China also faced difficulty in vehicle sales growth in 2018, which lowered rubber prices. A large portion of the production cost of heavy-duty tires includes costs incurred while sourcing raw materials that represent about 50% of the cost of a tire. Hence, the falling rubber prices will boost the profit margins for the tire manufacturers, which will fuel market growth during the forecast period," says a senior research analyst at Technavio.